The house is in a small development with about 35 other homes that share three wells. 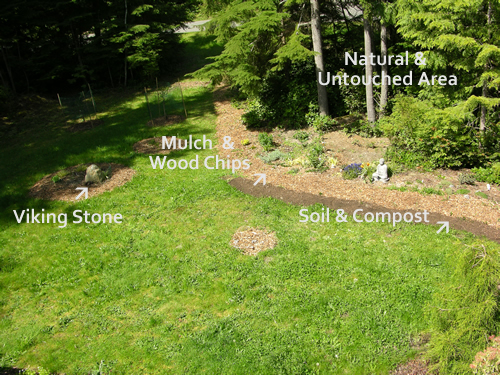 Each home has its own septic system and to make all this work, a large number of trees were apparently removed from the front yard and then all the soil was evidently removed in order to pull in water and electricity. It appears that the area was bulldozed and all the soil was removed to a depth of about 4-6 feet in order to lay a series of long channels for the septic system. These are about three feet in diameter and no matter where I dig, I keep finding more and more of them. They were covered with sand and then sod was rolled out on top of the sand. In short, this was mindless from both a gardening and ecological standpoint even if this is how the systems are built in this part of the world. 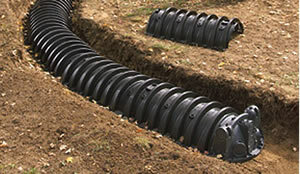 This image was taken from the web site of a company that designs and installs septic systems. This is part of the leach field and these infiltrators are buried under several feet of sand. This is the same area but from a different angle, four years later. The idea was to provide flowers for the bees consistently. 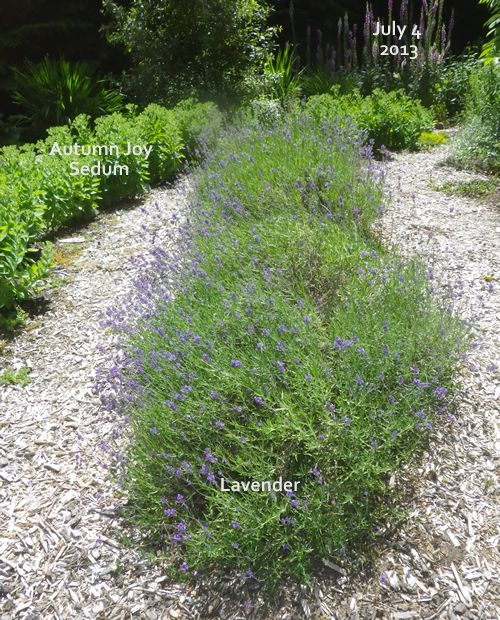 When the lavender peaks, bee balm will be in full bloom and shortly after that there will be mega amounts of sedum flowers that last until late October or sometimes even November. To reinforce some of the points I have been making in emails to subscribers as well as introductory material on this site, what I can say is that the grass really had no source of nutrition. This is why Scotts and other companies rely on the sale of massive amounts of growth stimulants and reseeding. In short, the lawns are not self-sustaining, even with the heavy rainfall in the Pacific Northwest. After a point, I realized how bad the soil is and I allowed everything to revert to a natural recovery mode. Yes, I got letters from the homeowner's association about dainty, fuzzy things that blow onto neighbor's yards, but I decided to mow, not weed. Obviously, poison was out of the question. What you see at this interim stage of conversion may look like neglect, but what is fascinating to me is how Nature manages a crisis when we simply leave everything to Her. 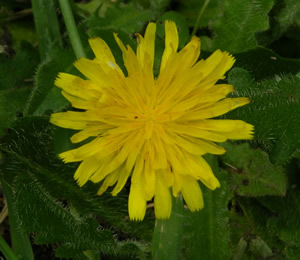 For instance, the false dandelion, aka spotted cat's ear, is common to the Western part of North America and is found wherever the soil is sandy. Like real dandelions, all parts of the plant are edible and Celeste, one of my Goffin cockatoos loves these flowers. More importantly, when allowed to grow, life returned to the soil. For the last two years, the ground has been "collapsing", meaning if I walk, my foot may sink a few inches, 2-8", and leave a deep indentation. There were very few firm places. Various amateur and professional gardeners gave advice ranging from rototilling to scraping off the top six inches and starting over again to dumping truckloads of soil on top of what is there. As an experiment, I had one load delivered and built up a few bedded areas, one of which is on the left of the picture above and below is the close up. Having been deeply touched by the photo of the bee inside the crocus taken by Dr. Zachary Huang and used in my bee flash, I planted some crocus bulbs around an as yet very tiny mimosa. 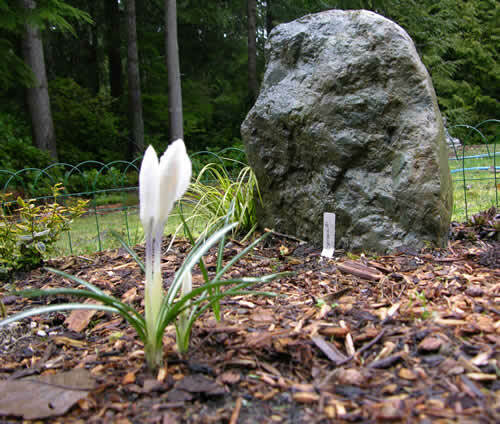 Next to the Viking stone is a stephania, very unusual plant that has yet to do very much but the season is young. There is some thyme and acorus in this area. A lot of attention was put into creating a truly viable test plot and the proof that this is working can be seen in the number of worms in the ground that never used to be there. Because we were building on top of the existing ground, we needed some ground covers to hold the soil at the perimeter between the area that was left in its natural state and the new landscaping. All of this was started late last year but the vinca is already very well established and the other plants are coming along. This is "next".